Neil Wright and his enchanting marble machine. There’s a bit of a running joke in the Wright household. When dentist Neil shows signs of ‘losing his marbles’, wife Carole says she knows exactly where to find them – in the magical marble machine that stands proud in their lounge room. Looking like something from a wizardly movie set, the machine is extraordinary testimony to Neil’s extra-curricular talent. Wind up the handle, turn the cogs and the clattering racket is matched by the spectacle of a hundred or so marbles spinning downwards, being pumped upwards, pinging through wind chimes, being scooped up into a wooden front-end loader, swept down spirals and springing off ‘ski-slopes’. Little wooden men positioned deep in its centre work at their task while at the top sits a quaint little house with ‘spring’ smoke twirling out the chimney. It’s all quite exhilarating – no matter the age of the spectator! 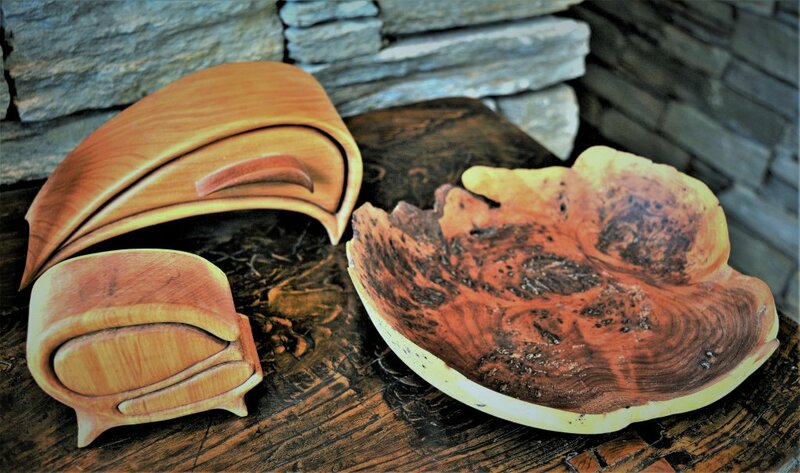 Neil clearly has an eye for the artistic and loves the entire creative process, from turning the nugget of an idea into churning out quite beautiful wooden items for family and friends. “I just enjoy doing it,” he says quietly, stating the obvious from his workshop. Carole has her own theory. “Wood doesn’t move, or bite when he drills into it,” she laughed. Three of Neil’s tiny masterpieces. The couple run Leamington Dental, with Neil leading the team of dentists and Carole as practice manager. Neil worked for six years in England before returning to New Zealand in 1990; thereafter he practised dentistry in Hamilton before starting Leamington Dental. There was also a seven-year spell spent in semi-retirement on Great Barrier Island. Neil took over and fixed a defunct lathe from his woodworker teaching/builder brother and started making a range of different items in wood. He had exercised his creativity gene during those years in the UK, primarily in doing DIY stuff in and around their home, but wood, he felt, was “unpredictable and could split”. Neil has since done a 180 on that and has become adept at making charming pieces for friends and family. 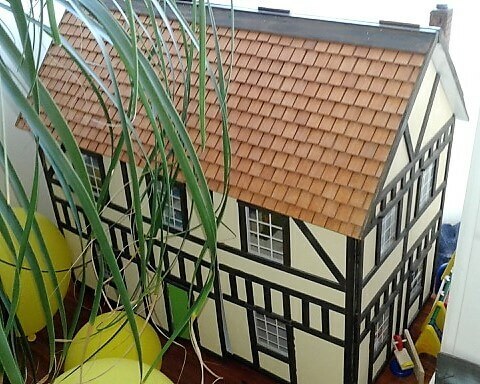 Neil made this Elizabethan doll’s house a few years ago. There are bowls, tiny oddly-shaped keepsakes, puzzles and pull-along toys, tiny streamlined cars, doll’s houses, forts, rocking horses and dinosaurs, wendy houses and the remarkable interactive marble machines that take his creativity to an altogether new level. 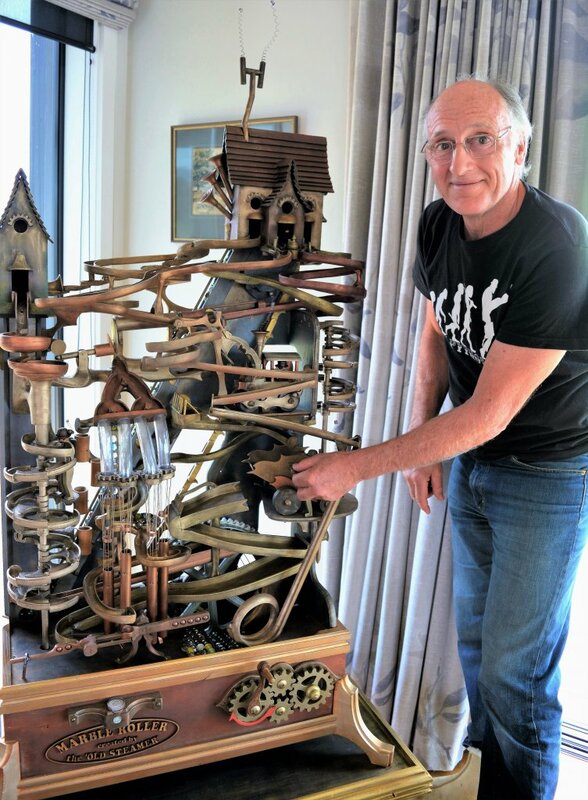 The large one in the lounge room – fashioned mainly in kauri – is the second of Neil’s marble machines. He reckons it took him about two years to build, working on and off, all the while fine-tuning the movement of the marbles. He made a smaller one a few years earlier, one that also does eye-popping things that keep the observer glued to each clever mechanism just to see how it works. The couple’s seven grandchildren add impetus to his woodworking. They’re often to be found beavering away with Neil in the workshop and have been presented with boxed gift sets which come complete with the wood required, pages of instructions, and everything needed to put it all together. “I was the test dummy for those,” laughed Carole.